As usual, Newcastle are way out on top of the Premier League Injury table (Physioroom.com) with 13 injured players out at the moment with the next in line being Manchester City with only eight injured players. Last season Newcastle had by far the worst injury record of any club in the Premier League and were top of the Injury League where one point is awarded when one player misses one Premier League game. 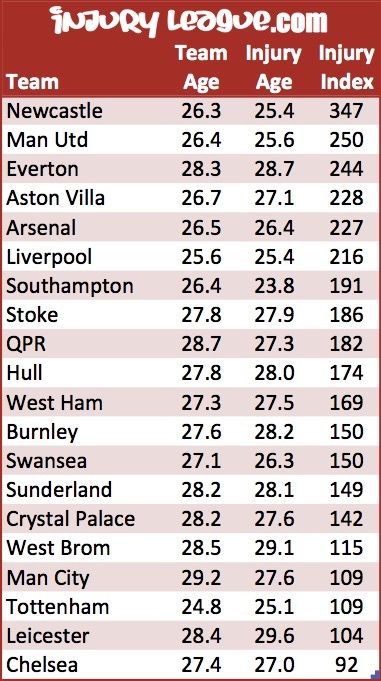 Last season we had 97 points more than the next club – Manchester United – who had only 72% of the points Newcastle amassed. Earlier this year sometimes we had fifteen first team players not available when John Carver was the interim head coach and now we have thirteen out injured, so whatever measures Newcastle took in the summer to cut down the injuries simply isn´t working. There´s been no change at all with our poor injury record. And other problems John Carver had for the second half of last season are affecting Steve McClaren and the coaching team this season. Newcastle players don´t seem to turn up at some games and some don´t even seem to care too much. And there are too many times this season that resemble our play under John Carver – the team collapses far too many times when the going gets tough. So there hasn´t been all that much change there either – the problems we have at Newcastle seem to be endemic. Newcastle will need to get their act together quickly if we are to start to get some wins that will take us up the league table and away from bottom place where we find ourselves after the first eight games. It certainly hasn´t helped things that we have now lost Tim Krul for the season, so we´ll be without one of our best players for the remaining 20 league games. We are hoping Rob Elliot and/or Karl Darlow will be able to adequately stand in for the Dutch International. And maybe young Freddie Woodman who has been recalled from his loan spell at Crawley Town may even be able to force himself into the first team. Steve McClaren has said the season starts against Norwich City on Sunday afternoon and he´s right. We need to win that game to double the number of points we have in the Premier League. That would be a very good start. Newcastle will try to sign Manchester United’s Spanish goalkeeper Victor Valdes, 33, as a replacement for Tim Krul, who will miss the rest of the season because of a knee injury. Never rated Valdez and was clearly a liabilty in goal for Barcelona and later Man U. Very inconsistent goalie. Very poor. I was buzzing first game of the season, our bench looked ok for once. Seems to be the same players injured all the time. and yet according to that same website 9 of those 13 will be available on or before the 19th of October,,,according to my calendar that will be in 7 days time , at which point we will be tied with Southampton and West Brom for 13 with 4 players out. Of course you could also look at the fact that every single one of those players on the injury list, except as of this weekend with Krul, and maybe Colback, has never been a regular starter at Newcastle anyway so who cares if they are on the injured list? they would not be first team players anyway so the premise of this article is pure nonsense. As Ed’s drawn parallels between this season and the latter part of last, It’s obvious that Carver was making some seemingly valid points about injuries and player attitudes. It’s just a shame he let himself down with his poor presentation. 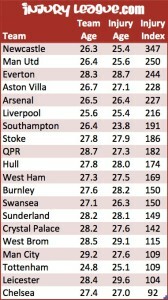 Interesting that if you look at that table we have the youngest team in the Premier league! lesh…there is actually no connection between injuries and league position. It’s easy to blame player attitude. Not sure what it is, but something tells it has more to do with the club. Something sets the tone and for some reason the players respond negative. do we get a trophy for being 1st? or go to special champions league? I’m not sure this is clearly the problem, Ed. Ok, it’s one of the problems, but our crocks haven’t been always our top players. We have some ‘regulars’ who push us up too, like SDJ and Taylor. Both should be released, as many other also runs. Harry is maybe right, that we don’t have the squad. Yet, individually, many in my team I would only switch with the very best in the PL! For teams at the bottom of the table: “That it should come to this!” – from the same play. Morning Ron…so how are we feeling this morning? To stay or not to stay in the PL. That is the question! You’re right. If we continue in our woeful way a January panic buy won’t save us. one of the best scenes from Hamlet. Maybe we should just get Cisse to perform another Voodoo ritual on the rest of the squad…. Or maybe he already has and that’s why we are playing like zombies! Time to recall Uri Geller maybe? Time to call someone, because “Black’s Magic” isn’t working. Now we have a player performing Voodoo for goals, with the help of Tiote. I know they said we had to go backward to move forward, but blimey we seem to have got stuck in reverse. The whole club is just a shambles from top to bottom, and I see no light at the end of a very dark tunnel. I like this one: Most Of Our World Leaders Are Space Lizards!!! Given the level of discussion this morning, I wonder when we can expect a post from Noam Chomsky? If we got (finally) relegated would it be so terrible? The only bad thing about relegation would be if Ashley didn’t do the right thing and sell up, if he piled another £50M on the debt would people STILL be saying how great he was for keeping us afloat. Isn’t Noam Chomsky are striker for Dynamo Kiev? Good point. Would Ashley cut his losses and move on? I think we’ll find out soon enough! It would hurt like hell, especially if the Makems stayed up. The only bright spot would be less Free Advertising for the Fat one, and that fact that the whole world will be able to see him as a failure for the first time. We could have and should have been flying in this league, but because of the incompetent running of our club we are bottom of the league, Massive clear out, wholesale changes end up being more like more empty promises, a collection of words to calm the masses and beguile the gullible. Relegation for our club this season should start a campaign to rid us of this Fat man, and the incompetent tools he chose to run the club. Yeah mate relegation would hurt a lot. Can’t blame Krul on Newcastle. Fact is, if you don’t have the ball and are making desperate last-ditch lunges to get it back, you are going to get injured more. If you are stroking it around the park and staying on your feet, it is less likely. It isn’t the NE weather or a dodgy pitch.